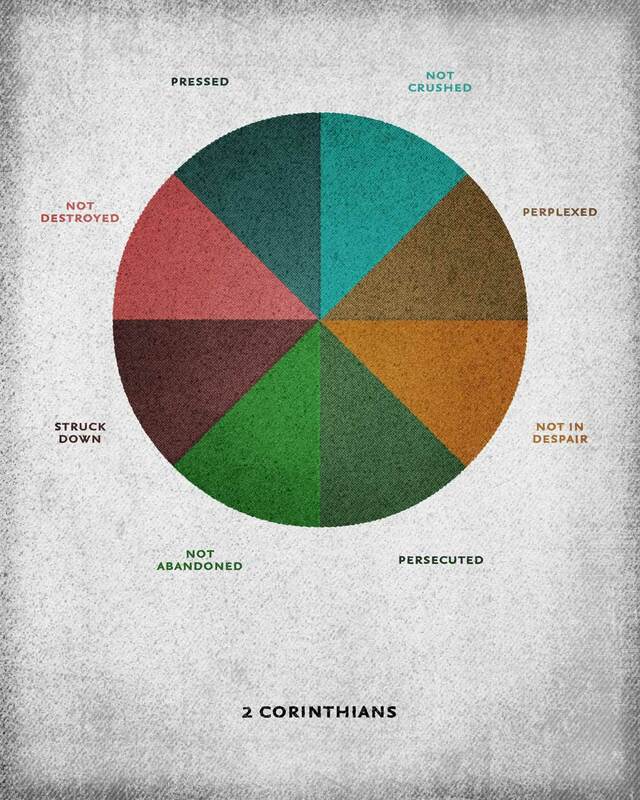 In 2 Corinthians, Paul gives us a world of extremes. He talks about being wise and foolish, having faith and not sight, being persecuted yet not abandoned, loving art yet owning a Thomas Kinkade painting. (OK, I made that last one up.) What's up, Paul? Do you have multiple personalities? My kid can't pray in school, so yeah, I totally understand persecution. In chapter 4, Paul goes through a list of things that basically come down to "here's a crappy thing in your life, but you're still all good." First century Christians were definitely dealing with crappy stuff. I'm not talking about trying to get prayer in school or making sure the Ten Commandments can hang in a courtroom. These folks were being physically threatened and harmed. I'm talking entire-families-fed-to-lions type of crapiness. So Paul is essentially saying, "through all this crap, God's got your back." But guess what, a lot of folks still ended up being lion dinner. If by "God's got my back" doesn't mean that my family is going to be saved from lions, what exactly does it mean? Here's my take.... Paul is looking at all of this from an eternal point of view. This time on earth is just a blip compared to eternity, right? So the crap that we deal with here on earth is viewed on the backdrop of an eternity spent with a creator who loves us. So you may be pressed, but at the same time, you're not crushed. You may be persecuted, but it's just as true that you're not abandoned. There's an eternal wellspring of hope with God. Somehow Paul's expectation of crap in this life seems to have gotten lost on many of us modern day Christ followers. In fact, there are many folks who seem to expect the complete opposite these days. Like if you join the Jesus club, you get money, safety, happiness and a popcorn tree in your backyard. (Guess I'll have to wait for heaven on that one.) If you ever hear that kind of stuff attached to Jesus' name, there's a 100% chance that you've stumbled into some false teaching. Paul never said Jesus will make you happy all the time or save you from all sickness and harm, but he did say that God will give us joy, peace and comfort. Those actually sound a little better, if you ask me.